Debates between different civilizations are common. Who started that war? Who invented that thing? Who found the cure to that disease? Who discovered and started using that technology first? So, who are the primary users of Mobile Business Intelligence (BI)? According to Dresner Advisory Services (DAS) latest Mobile Business Intelligence Market Study (October 2011), Mobile BI has penetrated EMEA (Europe, Middle East and Africa) most heavily, followed by North America and APAC (Asia Pacific). Around 23 percent of North America, about 27 percent of EMEA and 16 percent of APAC organizations give between 11 and 40 percent of their employees access to Mobile BI. Conversely, just under 60 percent of North American, 54 percent of EMEA and around 80 percent of APAC organizations give 10 percent or fewer of their employees access to Mobile BI. And, around eight percent of North America, 14 percent of EMEA and just four percent of APAC organizations give 81 percent or more of their employees access to Mobile BI. 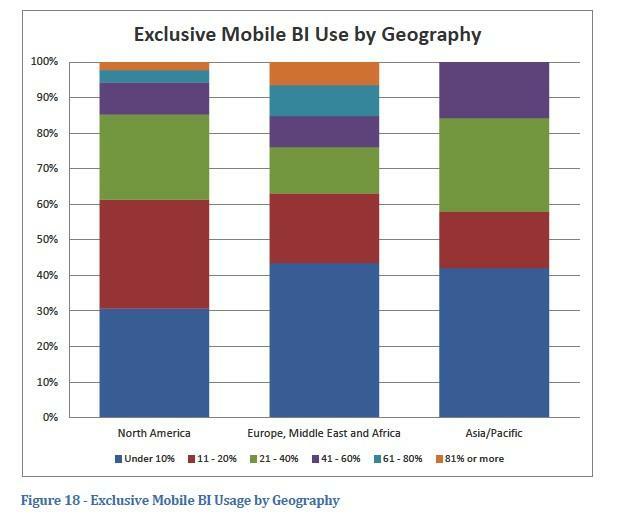 Interestingly, should future Mobile BI adoption plans come to fruition, EMEA’s dominance would be eroded. Approximately 30 percent of North American organizations plan to deliver some form of mobile reporting and analytics to between 11 and 40 percent of workers. A staggering 60 percent plan to offer mobile analytics to 41 percent or more of its workforce by 2014/15. Around 42 percent of EMEA organizations plan to deliver some form of mobile reporting and analytics to between 11 and 40 percent of workers. A more modest 38 percent plan to offer mobile analytics to 41 percent or more of its workforce by 2014/15. About 37 percent of APAC organizations plan to deliver some form of mobile reporting and analytics to between 11 and 40 percent of workers. And significantly, 53 percent plan to offer mobile analytics to 41 percent or more of its workforce by 2014/15 – up from the current figure of just four percent. In terms of future plans for exclusive Mobile BI usage over the next two years (mid 2011 to mid 2013), EMEA organizations plot a more conservative approach, with North American businesses harboring the most ambitious plans. Note: Exclusive Mobile BI usage means that identified individuals would only received BI content via mobile devices. Sixty-nine percent of North American organizations aim for 11 percent or more of their workers to access reporting and analytics exclusively via mobile devices by the end of 2013. The strategies of APAC and EMEA headquartered organizations are fairly comparable, with 58 percent of APAC and 56 percent of EMEA businesses planning to deliver 11 percent or more of their workers BI content exclusively via mobile devices by the conclusion of 2013. DAS’ 2011 Mobile BI market study has demonstrated that a smartphone – the iPhone – remains the preferred platform for Mobile BI. Thirty-two percent of respondents to the October 2011 survey cited the Apple smartphone as their first choice platform for Mobile BI. The iPad was a close second, with 30 percent listing the Apple tablet as their preferred platform. NOTE: Percentages do not equal 100 because respondents could select more than one option. Dresner’s lastest study demonstrates a significant increase in interest in the iPad as a Mobile BI platform. In the original 2010 study, 16 percent of respondents were using the iPad as part of their Mobile BI deployment, with 44 percent planning to integrate the iPad into their Mobile BI strategies over the ensuing 12 months. Notably, all iPad-related plans came to fruition, with 61 percent of 2011 survey respondents saying that the iPad is now in use within their organizations’ Mobile BI program. A further 21 percent plan on adopting the iPad for mobile reporting and analytics in 2012 and beyond. For the meantime, the iPhone remains the most widely used device for Mobile BI, with 70 percent of respondents currently receiving mobile analytics via an iPhone, and a further 18 percent planning to deploy iPhone-based Mobile BI initiatives during 2012. When analyzing platform priorities by geography, it’s clear that the iPad is more strongly favored amongst North American and APAC based organizations, compared to EMEA bodies. Contrariwise, the iPhone has stronger continuing interest in EMEA, compared to North America and APAC. 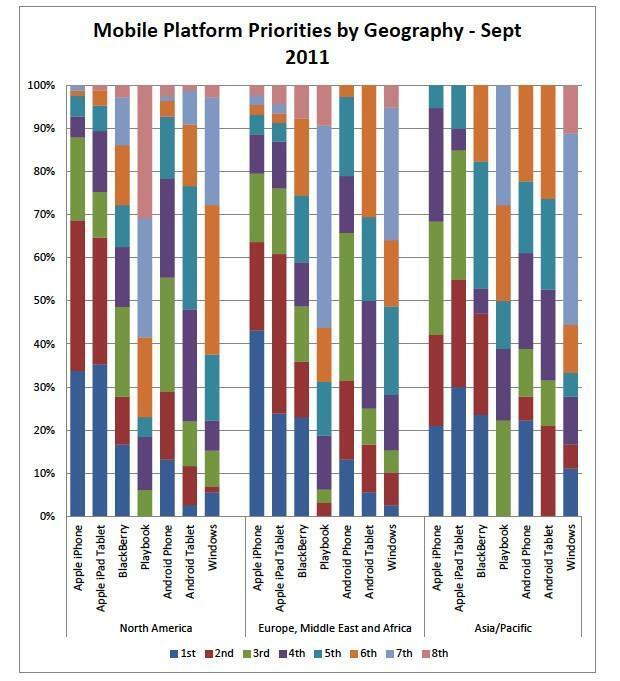 USA: North American organizations listed the iPad as the predominant first choice platform for Mobile BI (35 percent). Thirty-four percent listed the iPhone as their preferred device for mobile reporting and analytics. EMEA: EMEA organizations listed the iPhone as the predominant first choice platform for Mobile BI (43 percent). Twenty-four percent listed the iPad as their preferred device for mobile reporting and analytics. 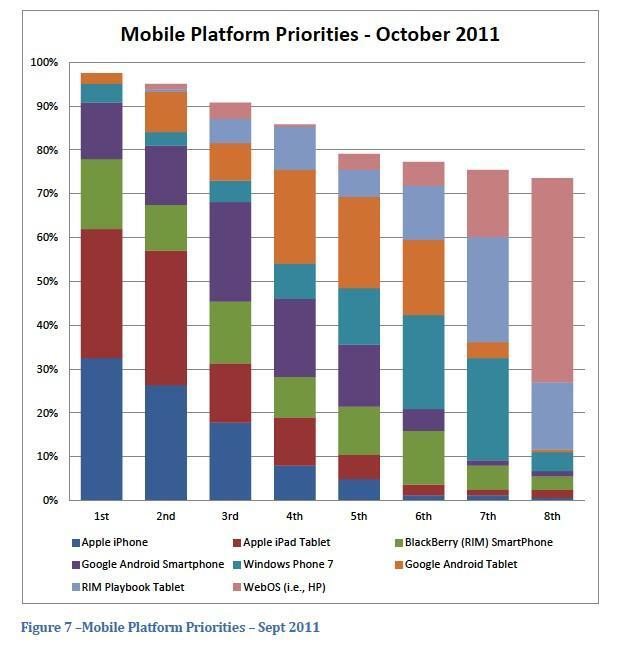 APAC: APAC organizations listed the iPad as the predominant first choice platform for Mobile BI (30 percent). Twenty-three percent listed BlackBerry as their preferred device for mobile reporting and analytics. 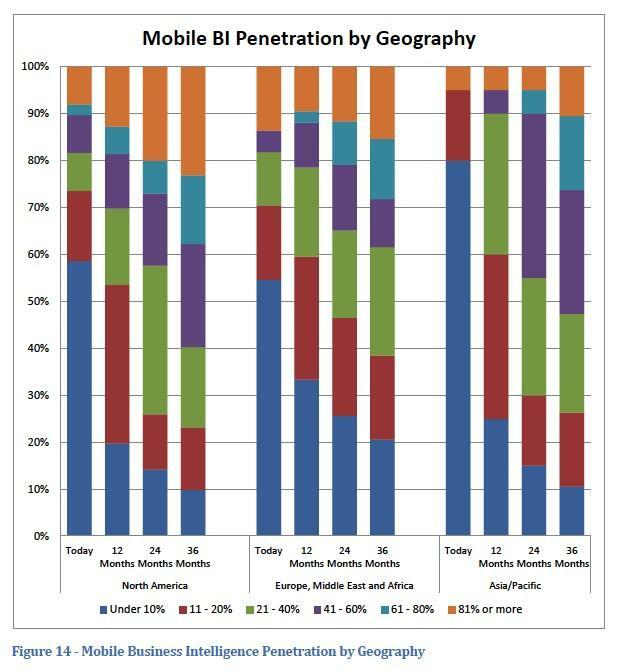 The report suggests that North America and APAC’s aforementioned, and comparatively more ambitious Mobile BI deployment plans, may be accounted for by EMEA’s slower adoption of tablet PCs – predominantly the iPad – to underpin mobile analytics initiatives.